I am getting pretty peeved with Google recently. I have a huge amount of music on my Google Music library, so much in fact, that I hit Google’s track limit for uploads. Now, I’m trying to download my purchased music back to my machine, but their MusicManager is winding me up no end. It downloads for a while, then stops, thinking it has finished, with several tracks not downloaded. I restart the download, and it goes on a bit more then stop again. Google suggested a few things, eventually ending up blaming my ISP. But there isn’t much alternative for me. Other than my current ISP, I can only use my corporate connection, but that requires a proxy – something Google do not support on MusicManager, or using Tor, which also doesn’t work properly. They suggested using the Google Music app, but that only works (if it ever does) on a single album. I even tried using AWS and Google Cloud, but the app ties to MAC and refuses to identify my machine (which is a virtual machine). I also tried using an LXC contain, and that worked for a bit longer, but also died. So now, I’m trying using a Docker image. Slightly different concept, but lets see if it works. If that doesn’t work, I’m going to try using TAILS. EDIT: Docker image didn’t work. So anything with a “true” virtual environment such as AWS, GC, and Docker don’t seem to work (VirtualBox will probably be in this list too), anything else (LXC, e.g.) will work, but fail later. I saw this on the latest update to Play Music the other day. Must say, I’m enjoying it. 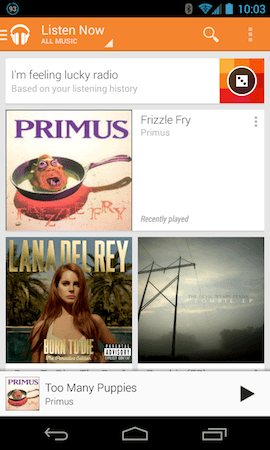 Google rolling out ‘I’m feeling lucky radio’ to Play Music on Android and the web. They’re running a couple of free episodes at the moment via here.